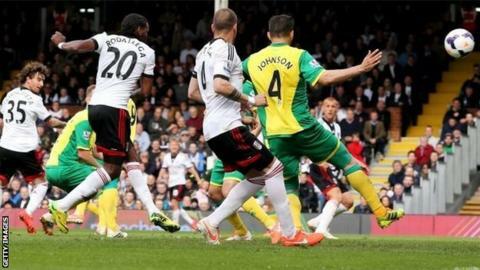 Hugo Rodallega scored the only goal to give Fulham a precious win in their relegation duel with Norwich. Rodallega swept home Lewis Holtby's first-half free-kick after it had been flicked on by Steve Sidwell. It leaves third-bottom Fulham just two points behind Norwich, who have a treacherous final four matches. New Canaries boss Neil Adams will wonder how his side failed to gain any reward from three excellent chances before Rodallega struck. But it is now three wins in five games for the Cottagers, who have responded positively to Felix Magath's appointment as their third manager of the season. Adams had made his presence felt as manager just six days after the dismissal of Chris Hughton, making six changes to the Norwich starting line-up, including restoring Michael Turner, who had recovered from a hamstring injury to make his first appearance since 1 January. Given the importance of the game, a cagey opening half-hour was not a surprise. Norwich's Nathan Redmond had a shot saved by David Stockdale, while Rodallega failed to capitalise on a couple of half-chances. But the game did not really come alive until Stockdale superbly turned away Ricky van Wolfswinkel's attempt to divert a low Martin Olsson cross into the net. Leroy Fer forced Stockdale into another excellent save as he got his head to Redmond's near-post corner, before Bradley Johnson drilled a shot wide. Norwich maintained the pressure and Robert Snodgrass had his head in his hands after his curling free-kick smacked against the crossbar. The visitors had good cause to regret their profligacy before the break as Rodallega struck for the second successive game. Holtby sent over a superb free-kick after Steven Whittaker fouled Kieran Richardson by the touchline, and Rodallega strode onto Steve Sidwell's near-post flick and swept home from four yards. The Colombian almost had a second straight after the interval when he met Richardson's corner with a powerful header at the far post, only for Olsson to nudge it round a post. Fulham's desperate need for points was shown in the way Brede Hangeland and Fernando Amorebieta closed in on Snodgrass as the Norwich man tried to reach Olsson's threatening pass deep inside the home penalty area. Even Rodallega was helping out at the back and the striker was in just the right place to turn a goalbound Turner header over the bar. Norwich remain outside the drop zone, but their run-in - Liverpool, Manchester United, Chelsea and Arsenal - leaves them in deep trouble as they try to preserve their top-flight status. Attempt missed. Ashkan Dejagah (Fulham) right footed shot from the centre of the box is just a bit too high. Assisted by Hugo Rodallega following a fast break. Offside, Norwich City. Nathan Redmond tries a through ball, but Gary Hooper is caught offside. Robert Snodgrass (Norwich City) is shown the yellow card for a bad foul. Foul by Robert Snodgrass (Norwich City). Kieran Richardson (Fulham) wins a free kick on the left wing. Corner, Norwich City. Conceded by Scott Parker. Robert Snodgrass (Norwich City) wins a free kick in the defensive half. Foul by Wes Hoolahan (Norwich City). Ashkan Dejagah (Fulham) wins a free kick on the left wing. Substitution, Fulham. William Kvist replaces Mahamadou Diarra. Foul by Nathan Redmond (Norwich City). Scott Parker (Fulham) wins a free kick on the left wing. Attempt missed. Josh Murphy (Norwich City) right footed shot from outside the box is close, but misses to the right. Substitution, Norwich City. Josh Murphy replaces Jonny Howson. Corner, Norwich City. Conceded by Steve Sidwell. Attempt saved. Steve Sidwell (Fulham) right footed shot from outside the box is saved in the centre of the goal. Assisted by Hugo Rodallega. Attempt blocked. Michael Turner (Norwich City) header from the centre of the box is blocked. Assisted by Robert Snodgrass with a cross. Corner, Norwich City. Conceded by Hugo Rodallega. Corner, Norwich City. Conceded by Fernando Amorebieta. Attempt blocked. Gary Hooper (Norwich City) right footed shot from the centre of the box is blocked. Assisted by Wes Hoolahan. Attempt missed. Scott Parker (Fulham) right footed shot from outside the box is close, but misses to the left. Assisted by Sascha Riether. Attempt missed. Robert Snodgrass (Norwich City) left footed shot from outside the box is high and wide to the left. Assisted by Steven Whittaker. Substitution, Fulham. Scott Parker replaces Lewis Holtby. Substitution, Norwich City. Wes Hoolahan replaces Leroy Fer. Attempt missed. Hugo Rodallega (Fulham) header from the centre of the box is high and wide to the left. Assisted by Ashkan Dejagah with a cross. Substitution, Norwich City. Gary Hooper replaces Ricky van Wolfswinkel. Substitution, Fulham. Ashkan Dejagah replaces Pajtim Kasami. Attempt missed. Robert Snodgrass (Norwich City) right footed shot from the centre of the box is close, but misses to the right. Assisted by Martin Olsson. Corner, Fulham. Conceded by Martin Olsson. Attempt blocked. Hugo Rodallega (Fulham) header from the centre of the box is blocked. Assisted by Kieran Richardson with a cross. Attempt blocked. Pajtim Kasami (Fulham) right footed shot from the right side of the box is blocked. Assisted by Hugo Rodallega. Attempt saved. Leroy Fer (Norwich City) left footed shot from outside the box is saved in the centre of the goal. Assisted by Robert Snodgrass. Foul by Fernando Amorebieta (Fulham).